It’s the final weekend before the Lunar New Year! To Malaysians out there who are celebrating, y’all know that be it far or near, this is the time of the year where families come together and catch up over a scrumptious spread of food, food, and more food! But, there’s a whole lot of do’s and don’ts, as well as a long things to check off from your to-do list before getting into the festive groove. So, if you’re one of those who are going to do the impossible this weekend, this is definitely your go-to checklist that will see you through the Lunar New Year smoothly! Squeaky clean floor, fresh sheets…it’s part of the tradition to ensure that you did your chores and keep your broom and feather duster away just before the strike of midnight. Plus, this is the only time where you can impress your aunty uncle with your immaculately impressive house. Many of us are not from the city, so if you’re hitting the road this weekend, please bring your car for a check. It might be a little too late to service your car at workshops now, but there are some basic things that can be sorted out easily at the gas station, such as your tyre pressure, and even ensuring that your car has enough water so that it will not overheat easily. You might be one of those who have the habit of borrowing cash from colleagues during lunch and this have prolly slipped through your mind (until THIS happened). So, don’t forget to repay what you’ve borrowed because, well, Malaysians are usually too paiseh (shy) to collect their debts from their friends. Do the right thing by returning things that doesn’t belong to you back to the rightful owner. 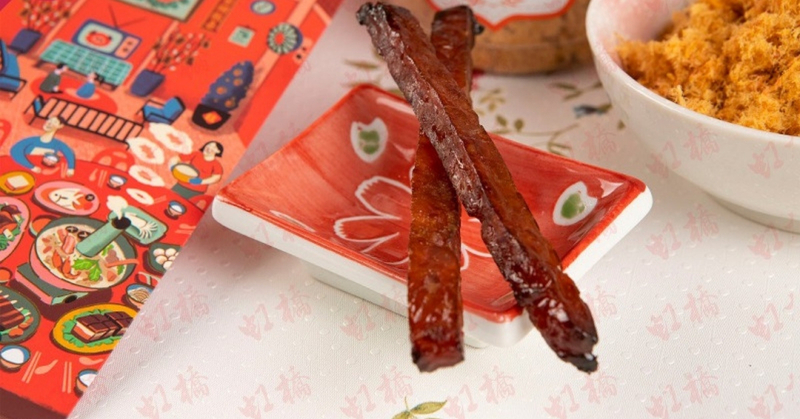 Bak kwa (aka rougan) is among the quintessential elements that make Chinese New Year special. Back in the days, I always felt like those who serve bak kwa to their guests during CNY are the wealthy ones (meat itself is pretty expensive, let alone meat that has been carefully processed and preserved). So, I recently chance upon this bak kwa that I got from Three Little Pigs and man, they are AMAZING! Available in 6 different flavours, there’s everything for everyone without needing to break the bank! First off, it’s not as greasy as compared to those popular ones in the market. If you are one of those who appreciate some extra heat in your food, go for their spicy smoke meat because while the heat adds that little kick, it doesn’t overpower the sweetness of the meat, and the sweet-spicy dual is a pretty good combo to the gradual crescendo of flavours. If you’re looking for a robust option, try their chicken smoke meat instead. Of course, my personal favourite goes to their black pepper meat because unlike the spicy one, this hits you with a freshly cracked punch that leaves you a pleasant tingle aftertaste, pretty much like your mouth have just tasted an epitomal fighting scene in an action movie! Lastly, if you’re all for gastronomical experiences, you definitely want to sink your teeth into their almond smoke meat. If you can’t quite wrap your head around this unusual flavour, just think of it as a textured bak kwa that gives you a nice mouth feel, perfect for those who want something extra to chew on! It’s still not too late to get them now. Their Love Lucky Gift Set comes together with a pack of ang pao (by far the prettiest I’ve seen), which make a perfect gift option during the festive period. Plus, you can get a 5% off the total bill when you get 3 boxes of bak kwa (as shown above)! What better way to get into the mood than playing some good old Chinese New Year songs? Yes, they may sound noisy and borderline annoying at times but hey, it helps to set the mood right and somehow, it sort of motivates you to munch more (please tell me I’m not alone). Sevenpie wishes you a Happy Chinese New Year and to those who are not celebrating, enjoy the jam-free period while you can!